Leading dispensing technology specialists, Lindal Group has launched an innovative new nasal actuator named Cyrano. Triangular with a uniquely rounded top, Cyrano has the appearance of a softer, more user-friendly design, ideally suited to nasal treatments for adult, child and infant markets. The actuator shape also forms a natural safeguard, preventing it from entering the nasal passage too fully, enabling a snug fit that facilitates a measured dispersion of its contents. Cyrano improves hygiene levels thanks to the closed actuator function which eliminates the risk of residue, thus preventing water from stagnating and keeping away germs. 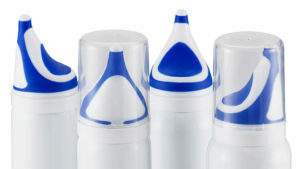 Cyrano is the first actuator in the nasal spray market with a feature that prevents water stagnation in the mounting cap. Cyrano has thermoplastic elastomer (TPE) material on both the finger pad and the top of the actuator creating a feeling of comfort and assurance to users that they are operating a safe product. Brand owners can diversify their products with Cyrano owing to its dual-material properties offering greater differentiation possibilities compared to other products – a valuable advantage in a competitive market, with existing and substantially similar products.